Ogden’s very own Danny Wildcard is a unique voice in local music, at least as far as I am concerned. It isn’t every day that one runs into a dark-sided banjo player with a penchant for rock n’ roll on the scene. It’s certainly refreshing—I haven’t listened to anything else like it. 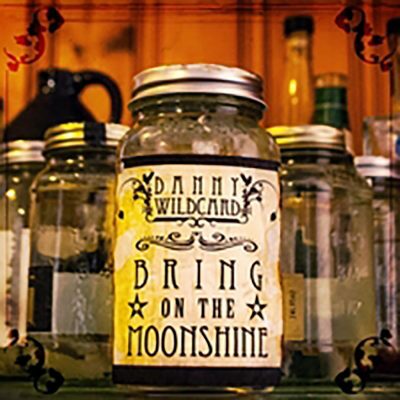 Bring on the Moonshine is Wildcard’s third album and one where he pushes the boundaries only he has established for himself. By combining his superb banjo play with just the right amount of synthesizer and effect pedals, Wildcard has carved a niche nobody else is occupying. Most couldn’t pull it off if they tried. Songs like “Falling Down” and “Dark Dark Medicine” display musical sensibilities and experimentation not expected from a dude carrying a banjo, but it works well. Wildcard creates a solid ambiance while plucking strings, something that sounds like it has a story to tell. “The Show, (Pt. 1)”—as well as Pt. 2 and Pt. 3, which form a triptych, one building upon the next throughout the album—is a prime example of Wildcard’s storytelling ability, both lyrically and with the strings he strums and manipulates. The combination solidifies the album.